A self-satisfied man sits in front of a display with 9 cups. 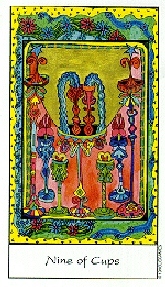 Meaning: Known as the "wish card", the 9 of cups means you are going to have your deepest desires granted. That doesn't necessarily mean great wealth or romance. In fact, it may even be a desire you didn't know you had. It can be unexpected, but it will result in a very deep sense of personal satisfaction.